Eighteen Bridges values the timeless narrative flair of The New Yorker, the journalistic rigour of Harpers, the literary excellence of Granta, and we hope to weave these elements together with a distinctive Canadian sensibility. We’ve partnered with fellow Edmonton literary magazine Glass Buffalo to provide a fantastic deal: two great award-winning magazines for one great award-worthy price. 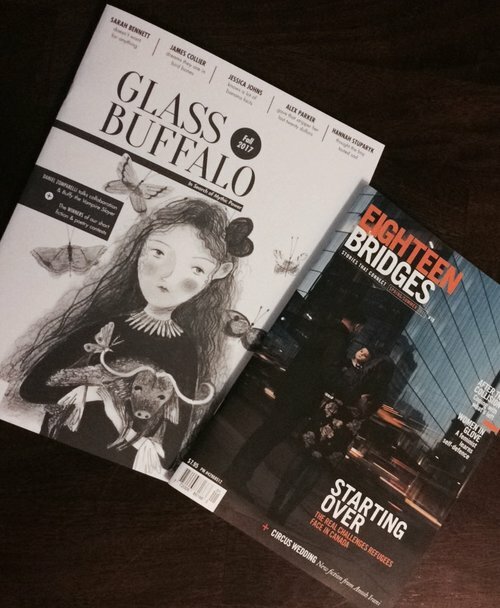 Subscribe for one year to Eighteen Bridges (two issues) and Glass Buffalo (three issues) for only $30! Bonus: if you send your receipt to ampa@albertamagazines.com, they’ll give you a subscription to another Alberta magazine for FREE. Take advantage of this sweet deal by November 15 2017. SUBSCRIBE or RENEW and receive the next four issues of Eighteen Bridges. Canada and USA: Four issues for $25.95 plus GST (total: $27.25 – save 20% off the annual newsstand cover price). HST or PST added at checkout, as applicable. International: Four issues for $65.95 includes shipping and handling. Eighteen Bridges is published with the support of the Canadian Literature Centre at the University of Alberta. NOTE: The online subscription system does not store your personal information. If you are renewing, you need to provide your information as if you were a new subscriber.